Unforgettable, that's what this was. 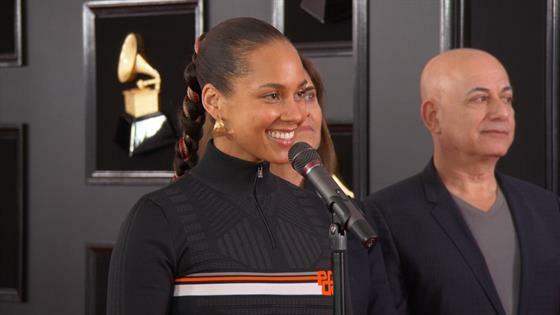 At the 2019 Grammys on Sunday, host Alicia Keys treated viewers to a beautiful—and double—piano performance of a medley of pop, R&B and rap hits from past and present years that have inspired her as a singer-songwriter. "How we feeling tonight? Yes, you know, the vibes are so right, at Club Keys, I want to welcome y'all to Club Keys, where the music is cool and timeless and the vibe is so sensational," she said. "I've been think so much about the people and the music that have inspired me and I want to give a shouted out to [late jazz pianist] Hazel Scott, because I always wanted to play two pianos." Keys' medley included "Killing Me Softly" by Roberta Flack and made more famous in 1997 by the Fugees, "Lucid Dreams" by Juice Wrld, "Unforgettable" by Nat King Cole, "Use Somebody" by Kings Of Leon, "In My Feelings" by Drake, "Boo'd Up" by Ella Mai, "Doo-Wop (That Thing)" by Fugees singer Lauryn Hill, plus Keys and Jay-Z's 2009 hit "Empire State of Mind." During her performance, Keys gave a birthday shout-out to Flack, who turned 82 on Sunday, and also paid tribute to her husband, Swizz Beatz, who was sitting in the audience. "You know, music is just, you know those songs that just live inside of you, it lives inside of me and you just love it so much because it was done so well that you wish you wrote it," Keys said. "That's how I feel about these songs. I wish I wrote them." The 2019 Grammys aired live on CBS from Los Angeles' Staples Center.